Described by one curator as 'swipe-specific', Zara Worth's practice deals with object making and how Instagram can be used as a site for performance to video. Richard Taylor finds out more. 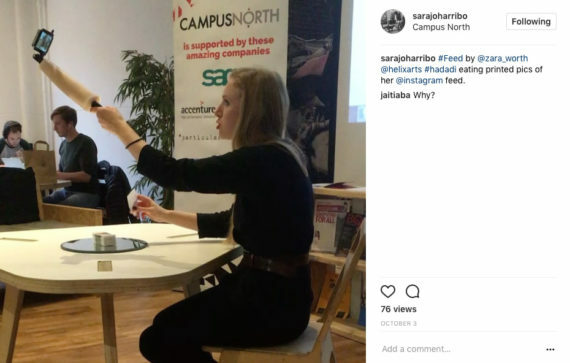 During a-n’s Leeds Assembly event at East Street Arts in June 2017, I found myself sat at a table with Zara Worth as she discussed her project ‘A drawing made by cutting up my body weight in celery’. 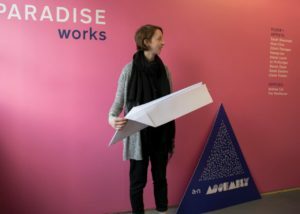 The piece “captured the process of cutting up a quantity of celery equivalent to my body weight a stem at a time, on top of a sheet of Arches paper”. In the end, the artist uploaded 900 short 12-30 second videos to her Instagram feed. It was her initial foray into a now ongoing body of work, concerned with Instagram and human relationships with hand-held technology. A physical drawing distils the project, the paper scarred from cutting the celery with her kitchen knife on top. It took just under 12 months to complete, a timescale which Worth finds interesting as it is “at odds with Instagram’s usual content”. The invested aesthetic of the work is tuned to her current practice-led research. In 2016 Worth was awarded a PhD studentship at Leeds Beckett University. Her research title is ‘The Artist Presents: Hybrid Practice for the ‘always-on’ generation’, and focuses on how “Instagram might be used as a site, strategy and subject for post-internet art practice”. 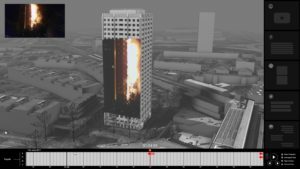 A combination of new media and real world objects is key to other projects, which look to affect the traditional privilege of IRL (‘in real life’) experience over “technologically mediated experience”. Initially intimidated by the medium’s “Insta-brag” culture when joining in 2013, the artist now approaches the app as a site, subject and medium; her work has been described by Texas-based curator Tyler Robarge as ‘Swipe-specific’. 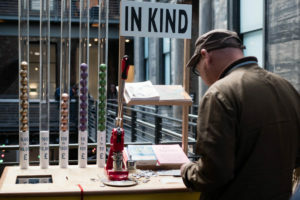 Worth continues using the platform to drive forward other projects, such as ‘Smile (for Harold)’ (top image), ‘Wellness’, and ‘Economics of the kitchen (an A to Z)’ (pictured above). The ongoing work, ‘Spectacles’, was started over a year ago when playing with Instagram’s My Story features and sees her collage onto photos from her personal library, to make a repeat pattern for an object. She plans on releasing a free ‘screenshotable’ version of the work, to coincide with her solo show ‘FEED’ at Vane, Newcastle upon Tyne, in August 2018. Another work, commissioned by Helix Arts, comprises two elements; ‘Herself’, a cast of Worth’s left forearm moulded around a selfie-stick; and ‘FEED’, a performance to video for Instagram showing her eating photos of food taken from her personal Instagram account and printed on rice paper. The piece deals with how people have multiple accounts, or ‘feeds’, on Instagram – something the artist is clearly guilty of herself. Such exploration drills deeper in Worth’s academic research. An essay written for Feast Journal, ‘Shared Meals: Instagram as a space for virtual feasting and rites of incorporation’, explores the “coactive process” of building Instagram communities. Worth is also working on a series of drawings and videos featuring gilding techniques. Other current projects include guest editing an issue of the Journal of Writing in Creative Practice which will feature artists, poets and curators as well as a new work by Worth, and will be accompanied by a series of videos on Instagram. 1. Zara Worth, ‘Smile (for Harold)’, 2018. Screenshot from @zara_worth Instagram. Courtesy: the artist. 2. Zara Worth, ‘A drawing made by cutting up my body weight in celery’, 2016. @zara_worth Instagram. Courtesy: the artist. 3. 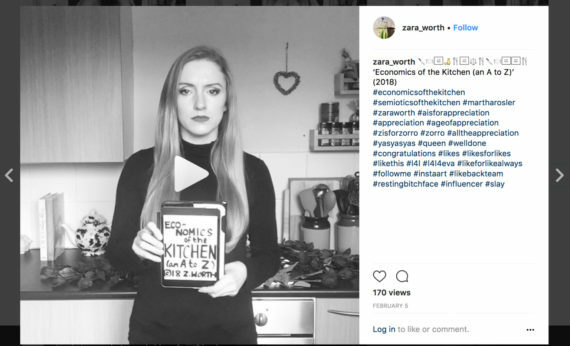 Zara Worth, ‘Economics of the kitchen (an A to Z)’, 2018. 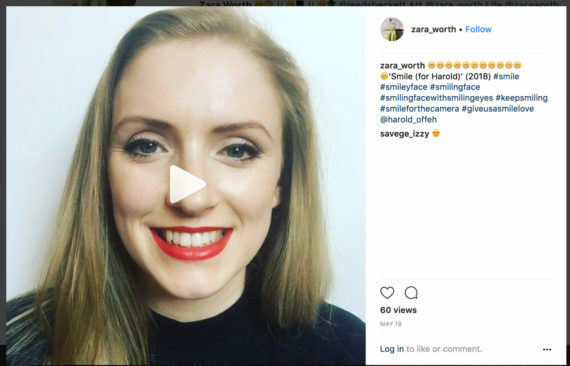 Screenshot from @zara_worth Instagram. Courtesy: the artist. 4. Zara Worth, ‘FEED’, performance to video for Instagram with ‘Herself’, cast forearm, 2017. Courtesy: the artist. 5. Zara Worth, ‘FEED’, performance to video for Instagram, 2017. Courtesy: the artist.